GREAT FOR SLUSHIES AND COCKTAILS ETC -- Use your ice crusher for cocktails as well as all sorts of delicious cooling drinks like iced coffee, fruit flavour slushies or sweet snow cones. You can also use the crushed ice in smoothies. 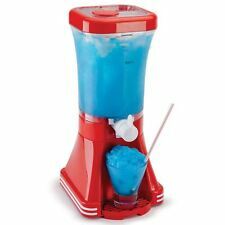 New in box Coca-Cola Blender Machine Slush Drink Frozen Make Ice Crusher Countertop Red. SEE PICTURES READY TO SHIP! Your Favorite Slushie Treats In Seconds. Make ice slushie in 30 minutes. With slushie dispenser faucet. Or it can also function as a fun cocktail maker for the adults. Before you know it your snow cone is full of beautifully crushed ice. Neo Ice Snow Cone. Used once and in brand new condition. Dispatched with Royal Mail 2nd Class. If chilled is your thing, whether it be fruit drinks, soda, coffee, iced smoothies or even your own recipe alcohol laced beverage, then the slushy maker is for you! Your little ones will have so much fun making their own icy treats with this fun Party Penguin Snow Cone Maker. Then, open the Penguin's belly to retrieve the treat. Party Penguin Snow Cone Maker. Easily Creates Ice Treats. Jelly Belly Manual Crank Ice Shaver Snow Cone Slushy Maker Complete. Uses Ice Cubes Or Molds; BPA-Free Plastic Construction. Complete in Box, Manual, plastic bags. Disney’s FROZEN Character “Olaf” Snow Cone Maker, Great Condition! Includes everything pictured. Treat Shoppe Condition is Used. Shipped with USPS Priority Mail. The Nostalgia RSM650COKE 32 oz. Coca-Cola Slush Drink Maker is a gem for any Coke collector. Featuring 32 oz. freezing tank that creates the best frozen Cokes or other slush drinks, while the easy-flow spout dispenses that drink with smooth consistency. 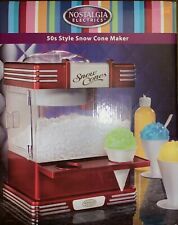 Includes snow cone maker and user manual. Does not include ingredients. Create the perfect frosted treat with this super easy to use Snow Cone Machine. Fill it up with ice and watch as it turns it into ice shavings. GREAT FOR SLUSHIES AND CKTAILS ETC -- Use your ice crusher for cktails as well as all sorts of delicious oling drinks like iced ffee, fruit flavour slushies or sweet snow nes. You can also use the crushed ice in smoothies. Choose between fine or coarse shaved ice by simply turning the dial on the machine. GREAT FOR SLUSHIES AND COCKTAILS ETC -- Use your ice crusher to make all sorts of delicious cooling drinks like iced coffee, fruit flavour slushies or sweet snow cones. The original Frosty mug turns nearly any beverage into slushy in just a few minutes. You will be able to see the drink changes into a yummy, crunchy, frosty frozen treat slushy drink. The last step is to stir the drinks with the spoon provided for 2 minutes. [SO SUSHI ver.2] Sushi Maker Easy Tasty Fancy! It can also be used as dishes. It is a fashionable and high quality sushi set. Even children are full-blown, you can easily make sushi. Chic chinaware is used for dishes. Wash with dishwasher, dish, dish, mold all in a compact storage location. Rilakkuma Spoon Fork Case Storage Set Cute Bear. Model : Rilakkuma New Spoon and Fork Case. for Children Gift and Eating. Spoon, Fork - 165mm. Material : Plastic, Iron. Quantity : 1 pc. Size : Case - 182 x 73 mm. GREAT FOR SLUSHIES AND COCKTAILS ETC -- Use your ice crusher to make all sorts of delicious cooling drinks like iced coffee, fruit flavour slushies or sweet snow cones. You can also use the crushed ice in smoothies.